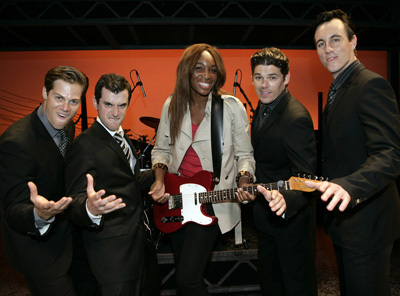 Tennis Star Venus Visits Melbourne Jersey Boys! News from Herald Sun: Tennis champ Venus Williams relaxed before kicking off her Australian Open campaign by attending a show of the hit stage musical the Jersey Boys. Williams met the cast Stephen Mahy, Bobby Fox, Scott Johnson and Glaston Toft, after the performance. She raved about the show and its vast array of hit Frankie Valli tunes. So impressed was the tennis ace that she urged her equally famous sister, Serena, to make time to see the show. Serena was expected to attend the show tonight. Buy Jersey Boys Tickets Online. <a href="" title=""> <abbr title=""> <acronym title=""> <b> <blockquote cite=""> <cite> <code> <del datetime=""> <em> <i> <q cite=""> <strike> <strong> . Disclaimer: JerseyBoysBroadwayTicketsOnline.com is not affiliated with any official Jersey Boys site, any venue box office or any Jersey Boys fan clubs, partners, or sponsors. Any trademarked terms that appear on this page are used for descriptive purposes only.